Kate and I get asked a lot about the kinds of go-to foods we have at home when we need quick and easy meals. In my house we have plenty of frozen pizzas, burritos, and chicken nuggets in the freezer, but when I actually want a quick home-cooked meal, I have to say I probably grab eggs most often. When I lived in Brazil, I got used to eating eggs in creative ways. People often fried them up and served them over black beans and rice, in a salad, or as a topping for pizza. To this day, a hot fried egg over beans is one of my favorite comfort foods. At my house I often whip up scrambled egg burritos or quesadillas, pile eggs on english muffins with hot ham or pastrami and cheese, or make omelets or frittatas. Most egg dishes lend well to using up scraps of random veggies you have in your fridge, which make them a great last-minute I’m-totally-out-of-food meal. Just last night when my little brother was visiting (and was rather shocked to find his food-blogger-sister’s cupboards quite bare) he rummaged through the fridge and whipped up an awesome scramble with bacon, roasted red peppers, and peperoncinis. So quick and so great. This recipe was inspired by Eggs Florentine, which is a super amazing and slightly naughty dish of poached eggs on english muffins with spinach and hollandaise sauce. This version is lightened up and made to be quick and easy. It’s totally something I think of as momma-lunch. When, as a stay at home Mom you find a magical moment when you realize you have a few moments of peace and can actually prepare something wholesome and filling for yourself as opposed to eating the rest of the dino-nuggets left on the kids plates and snacking on chocolate bars (please tell me I’m not the only one who does that.) My husband is usually home for lunch, so sometimes while the kids are chowing down on PB&J’s I’ll make something like this for us (which is why the recipe is written for 2). It makes a great breakfast, brunch, lunch, or dinner. 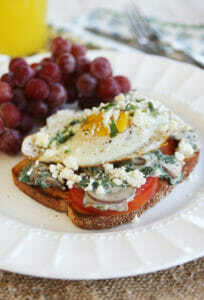 You’ll just need eggs, a couple of slices of bread, a tomato, some spinach, mushrooms, and a tiny bit of cream cheese. 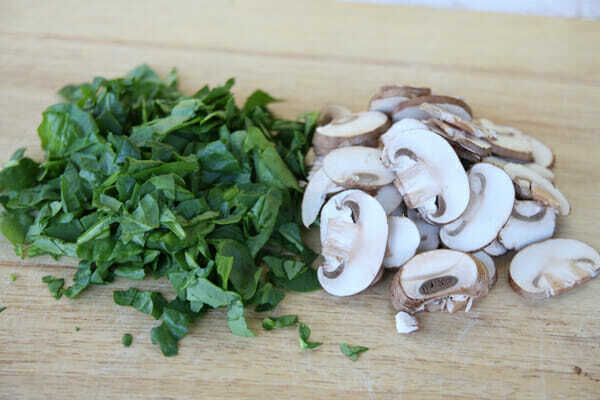 Slice the mushrooms and give the spinach a rough chop. 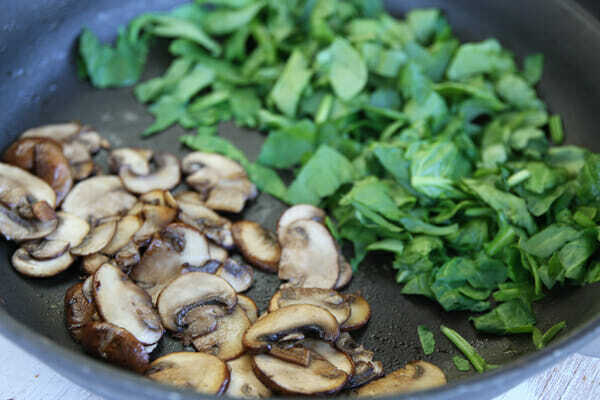 Toss the mushrooms in a hot skillet with a little drizzle of olive oil to start browning. While those are cooking, you’ll mix up your creamy sauce. Remember a few weeks ago when I posted this yummy Zucchini Ribbon Pasta dish? I explained in that recipe that while I don’t often use fat free cream cheese in cooking, it does tend to work great in sauces. That recipe only uses part of a package of cream cheese and when that happens I always try to come up with recipes that can use the rest so you can plan accordingly. This won’t use all of the rest, but it uses a little! You can use regular, low-fat, or even fat free here. 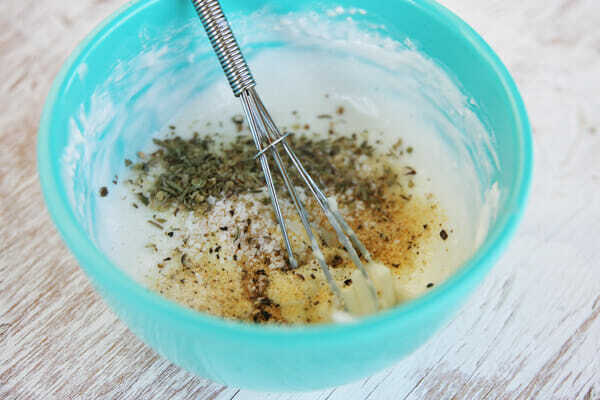 Since this recipe is written for 2, we just need an ounce of the cream cheese and we’ll thin it out to a creamy sauce using some nonfat milk and add spices for flavor. Make sure to microwave and whisk the cream cheese well to get all of those lumps out. 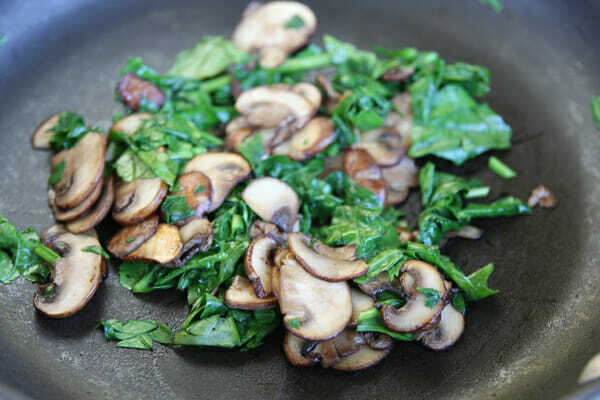 When the mushrooms have cooked for a few minutes and are browned up, toss in the spinach. It literally takes about 8 seconds for it to wilt. Then add the creamy mixture to the veggies and stir to heat it though. Since I like to avoid getting all of my pans dirty, especially on a quick dish like this, I scrape all of the creamy sauce into a bowl and cover it, give the pan a quick rinse, and then put it back on the stove to cook up my eggs. You can fry your eggs or poach them, whichever you prefer. 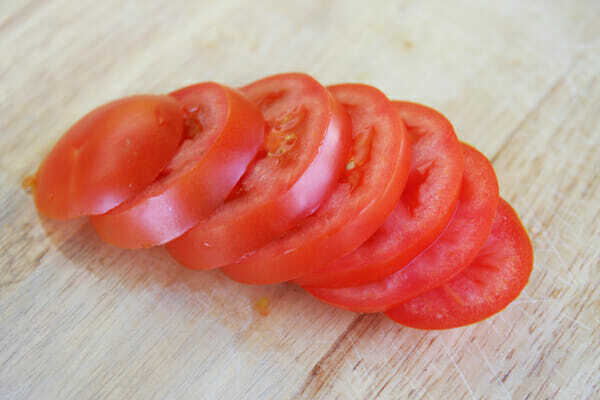 While they’re cooking, slice up a ripe tomato. And toast a couple slices of bread. Whole grain is extra healthy, but if I’m being honest, hot buttered sourdough would be my first pick! Layer a couple tomato slices on the bread, top with the spinach sauce, and then an egg. If your sauce has thickened from sitting, just whisk in a little extra milk. Completely optional (I happened to have some in my fridge this time around) is a sprinkle of feta cheese and some chopped parsley. I eat it with a knife and fork. 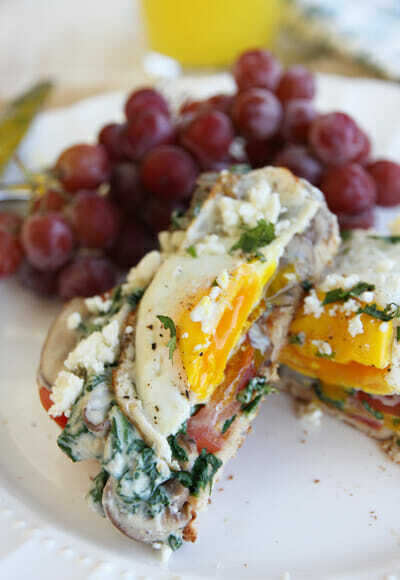 The toasted bread sort of sops up the creamy sauce and the egg yolk and the juices from the tomato. You get a lot of flavors and textures and one serving is super filling. Momma lunch at its best! Heat a medium skillet to medium-high heat. Add olive oil and mushrooms and cook 3-5 minutes, until golden brown. If needed, add cooking spray during cooking process. While mushrooms are cooking, place cream cheese in a small, microwave-safe bowl. Warm in 20 second intervals until melted and can be stirred smooth. Add, garlic, onion, oregano, salt and pepper. Add milk a little at a time and whisk until smooth, heating more if necessary until you have a nice sauce consistency. Toast bread in toaster and top each with a couple of tomato slices (if desired, you can quickly warm tomatoes in hot pan). Spoon spinach mixture over each serving and top with egg. Sprinkle with feta and parsley if desired. Serves 2. Note: We do not provide nutritional information on all of our recipes. Occasionally we’ve calculated them ourselves and share with you. If you haven’t entered our ipad giveaway, time is about up! And don’t forget to check out our brand new cookbook. It’s hitting shelves soon, and available for pre-order now! I love how you use cream cheese as a sauce base in so many things. It’s something I wouldn’t have thought of but I love how it’s easy, light, and delicious! wow that DOES sound like a happy birthday! 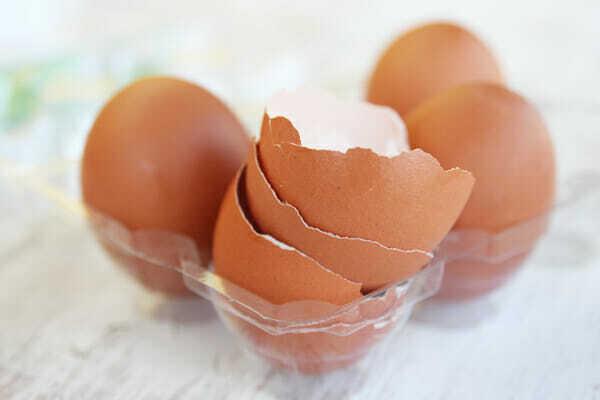 Eggs are my go-to quick meal as well. Yes! I too love eggs with veggies and , thankfully, my kids like some versions too. I’ll definitely be trying this soon. Thanks! I just made this for breakfast and it was wonderful! I’ll definitely make it again. So glad you already tried it and loved it! Whenever people say “eggs on toast” I always think of Nanny McPhee. But that’s probably just me;) Anyway, this looks great! You girls have great timing! After sending my 2 oldest kids off to school today and wondering what I’m going to make for lunch with just my 2 year-old here, I saw this and knew I HAD to make it. Just got done eating it and was seriously so delicious! Thanks for helping me think outside the box when it comes to the sameold, everyday, boring lunchtime routine. Wow, this looks really quick, easy, and tasty! I think I don’t have what it takes to get my kids to try it though, anyway you can think to make this more ‘healthy invisible’ so I can con my children into trying it? 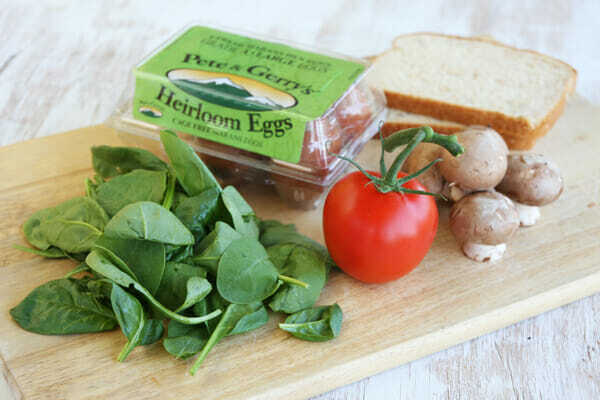 You could leave out the mushrooms (and even the spinach, or chop it up super small and add canadian bacon, real bacon, or ham. I mixed it up with crumbled crackers and halved baby tomatoes for my kids. Eating the rest of your kids dino-nuggets for lunch? SO GLAD I am not the only one who does this!!! I was thinking I am alone in this, but knowing others do it, makes me feel so much better! Looks good! I can’t wait to give it a try! Thanks for the unique recipes! I just love you guys!!! Sara, I am going to make this for my very own Mama-Lunch right now! Thanks for the fun inspiration! Sara, I am going to make this for my very own Mama-Lunch right now! Thanksfor the yummy idea! Oh my goodness! That looks amazing. I always try and have at least a dozen eggs in my fridge to whip up whenever I need a quick meal and haven’t been to the store lately or don’t feel like cooking! Love, love what the bit of cream cheese does for this dish and lucky enough to have 6 pretty hens to provide the eggs! You are my heros! I too am in a calorie counting phase of my life being as I delivered twins 6 months ago and they lived in the NICU (where I too parked my post pregnant body) for 5 months. Now that I have all my babies under one roof I’m finally ready to start losing the baby weight. So keep the healthy and hearty meals coming! I need all the inspiration I can get! My 2 older kids and I cook from your cookbook every night for dinner. It has been a great bonding experience for us that we needed after all the time I spent away from them while in the NICU. Thanks for helping us reconnect as a family through the cooking! The Creason family LOVES you! After all that I forgot to mention that I JUST made this for breakfast and it was FABULOUS!!!!! I just made this…and I’m not ashamed to say I licked my plate when it was all gone. 🙂 And I’m stuffed. Thank you! This looks amazing. I think I going to make it a breakfast for dinner meal! yum! I love that you included the nutritional information on this recipe. I’m trying to eat healthier and this really helps. I made this for a late dinner (10 p.m.) last night. Gosh it was delicious! My husband ate his one and stole the other half of mine. I showed him your post and he said mine was as pretty as yours. I am glad I stumbled accross your blog, and I look forward to trying other recipes. Thanks! INCREDIBLY simple and DELICIOUS! 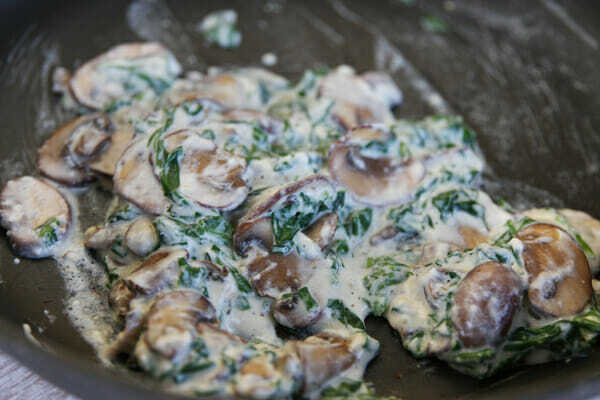 I actually sauteed onions and garlic in with spinach rather than using powders. SO GOOD! Finally something I had all the ingredients for! I saw it, made it, ate it in less than an hour. Yummy! Loved it. It was perfect as a late-night, nine-months-pregnant, healthy snack. This was soooo good! I made it for dinner tonight and my husband, my nine-year-old son, and I ate every bite. My son asked if we could have it for dinner again tomorrow night! I used my garden tomatoes with it and it was delicious! Thanks for the fabulous recipe. Looks delish! I don’t see the print button though? I am going to try using your sauce to do an open-faced sandwich with sautéed chicken over fresh bread. Wish me luck ;). Love. This. I’ve made it twice this week. Struggling a bit with the egg frying … Can’t get it just right, I could use a tutorial 🙂 that mushroom/spinach topping I could eat with a spoon ( well… I do!!) thank you!! So looking forward to this, I can’t wait to go to the store tomorrow as I am out of spinach. I made this for dinner tonight and it really hit the spot! What a great, quick, easy, and super yummy dinner/brunch/lunch/breakfast idea! Thank you again for all the inspiration! Made this for dinner tonight. We didn’t have mushrooms and I cooked our eggs so there were no runny yolks. We absolutely loved it! I will be making it again very soon! 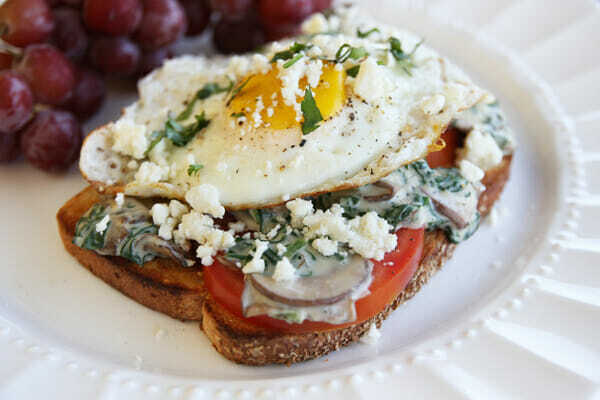 Made this for dinner – great idea to mix up eggs and toast! I had to saute up some onions in place of the mushrooms since I didn’t have any, but I bet those would have made it even better!